One of the most commonly injured parts of the body in adolescents is the foot and ankle, particularly those involved in sports. Consider demographics: More than 2.6 million children are treated in the emergency department each year for sports and recreational-related injuries; over 30 Million kids are involved in at least one interscholastic sports program; 21.5 Million kids are playing on one or more organized sports teams! Therefore it is prudent to understand how functional foot types may predispose athletes to particular conditions and risk of injury. This article will review 6 functional foot types, in relation to structure and functional gait, common injuries to each, sport risk concerns, and physical management including orthotic recommendations. Toddlers begin walking around 12-14 months. At the age of 2-3yo it is quite common for the child’s foot to be pronated, but by the age of 6-8yo the heel should be assuming a vertical alignment in standing. By 9-13yo the foot will be attaining its adult form and ideally assume an inverted heel alignment of about 4-5 degrees. It is important for the Pedorthist to understand that children are not merely “mini-adults”, and consideration needs to be given to the physical plates and growth. The long bones in the legs and arms grow from an area at either end called the physis, or growth plate. When a child’s bones have completed growing, the growth plates ossify and cause the epiphysis to fuse together with the metaphysis, forming one complete bone. Skeletal maturity is typically reached in girls around the ages of 13-15, while boys’ growth plates close around the ages of 15-17. Around the ages of 13-15 the child’s foot will begin to evolve into its adult form, most often mirroring the foot type of Mom or Dad. Particular attention needs to be paid to young athletes complaining of pain, since the growth plates are susceptible to fracture. There are 6 functional foot groups (called “Quads”) that present themselves as a child’s foot matures into adult form. 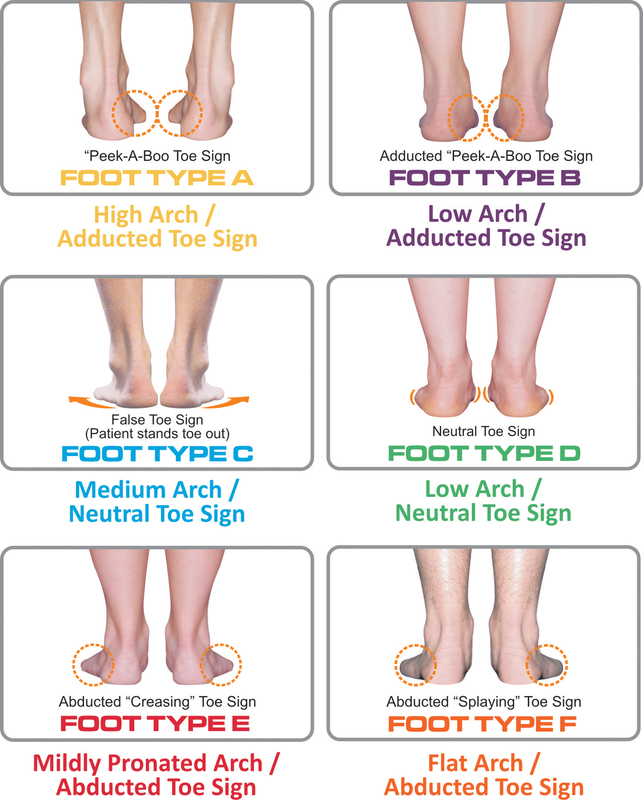 Foot type is identified by simply observing how arch height couples with forefoot “toe-sign”. Each Quad produces a distinctive gait pattern. The characteristics each Quad is summarized below along with a list of potential injuries relative to gait style and sports. Foot Morphology: The “A-Quad” has an uncompensated (supinated) rearfoot combined with a forefoot valgus, resulting in a combined foot condition referred to as “torque foot”. This is a Pes Cavus foot with and inverted heel and an adducted forefoot. Gait: STJ pronation is restricted during contact phase resulting in a rigid midfoot with high impact and shock. Upon foot flat, the 1st ray loads prematurely driving the foot and ankle into increased supination throughout propulsion. The resultant gait is a rectilinear pattern with a narrow base of support and a propensity towards over supination. Common Injuries: Excessive supination often leads to lateral ankle instability and sprains, Jone’s fractures, sesamoiditis, and peroneal longus tendinitis. Sport Risk Concerns: Risk factors are those activities, such as basketball and jumping sports, in which an athlete can come down on and turn the ankle or step on an opponent’s foot. Management of the A Quad: Ankle strapping or bracing, and orthotic intervention are warranted for “A-Quad” Athletes, especially those with prior injury. Orthotic recommendations include a deep heel cup with lateral heel clip, a lateral flare at the base of the 5th metatarsal, lateral forefoot posting with a 1st met cutout, and heel elevation for associated forefoot equinus, which is commonly associated with this foot type. Foot Morphology: The “B-Quad” is a mildly pronated rearfoot combined with a flexible forefoot valgus. It has a lower arch, and vertical or slightly inverted heel and adducted forefoot. Gait: This foot pronates during contact phase but can resupinate during midstance due to the presence of a flexible forefoot valgus (or plantarflexed 1st ray), which decelerates rearfoot pronation. In propulsion, the hypermobile 1st ray dorsiflexes, transferring weight to the 2nd met. The gait is “in-toed” or “pigeon-toed”. Common Injuries: The in-toed gait draws the lower limb into internal rotation at the hips leading to muscle imbalances and weakness at the pelvis, hips and core. Common injuries include sacroiliac pain and 1st ray hypermobility and pathology. Torsional deformities of the limbs, such as femoral anteversion, internal tibial torsion, or metatarsal adductus may cause or exaggerate the in-toeing. Sport Risk Concerns: “B-Quad” Athletes involved in ballistic sports requiring jumping, cutting and pivoting are at increased risk of injury. Low back pain should be examined carefully to rule out sacral stress fractures (more common in young female adolescents) caused by repetitive stress from sports such as gymnastics, football or other impact sports, or long distance running. Management of the B Quad: Core and hip strengthening are essential for this foot type to restore proximal stability. Orthotic recommendations include mild medial rearfoot posting and a mild medial skive, and a reverse Morton’s extension. Do not to “over-post” the rearfoot if internal tibial torsion or femoral anteversion are present, since these conditions may necessitate some degree of pronation for compensation. Foot Morphology: This foot is an underpronator. At times it may appear “Normal”, and at times “Subtle Pes Cavus”. This foot-type exists when an uncompensated rearfoot varus is coupled with a relatively neutral forefoot. A key distinguishing feature of this foot-type is an obvious toe-out gait pattern with a “normal” or slightly cavus arch height, and a “false” toe sign. Gait: This gait is “toe-out” (like a duck) because the subtalar joint lacks pronation, making loading the inner aspect of the feet extremely difficult. As a result the body must acquire the necessary motion to load the medial foot by externally rotating the hips, causing tightness of the lateral hip rotators and ITB. Common Injuries: Hip and ITB tightness often leads to hip bursitis, ITB Syndrome, low back pain, and frequent muscle strains (hamstring, TFL, Sartorius, and rectus femoris), and occasionally femoral stress fractures (more common in females). The inverted heel alters vector forces on the Achilles leading to lateral insertional tendinitis, or cancaneal apophysitis. Sport Risk Concerns: Ten percent to 24% of athletic injuries in children are hip related. Ballet dancers are most likely to have a hip-related injury, and runners, hockey players, and soccer players are also prone to hip injuries. Management of the C Quad: C-Quads tend to be very tight, particularly at the hips and back, so stretching is essential. Orthotic recommendations include a moderate heel cup depth with a heel balancing post to “bring the ground up to the rearfoot”. DO NOT add a medial skive to this orthosis as it will not be tolerated well. Foot Morphology: This is a congenitally splayed flat foot. A child demonstrating excessive pronation beyond the age of 6yo has “Developmental Flat Foot”. Although early intervention is warranted, treatment is often neglected in the belief that the child will “outgrow it”. Left untreated DFF matures into the adult D-Quad, a moderately over-pronated foot-type. This foot-type occurs when a compensated rearfoot varus couples with a neutral forefoot alignment. The foot looks like a “Fred-Flintstone” foot with a vertical heel and a neutral toe sign. Gait: This foot immediately pronates at the subtalar joint at heel strike, and continues to pronate throughout midstance. The midtarsal joint unlocks and the midfoot collapses, causing lateral column instability and subluxation of the calcaneal cuboid. This disrupts the peroneal (longus) pulley system and the 1st ray becomes unstable. During propulsion, the 1st and 5th rays dorsiflex causing reversal of the transverse metatarsal arch. Common Injuries: The planus foot of the adolescent athlete presents with symptoms commonly associated with flat feet, such as: plantar fasciitis, metatarsalgia and neuroma due to reversal of the transverse metatarsal arch, and functional hallux limitus. Freiberg’s Infarction is avascular necrosis of the 2nd metatarsal epiphysis, most common in girls around 13yo. Patellofemoral pain syndrome is another common condition associated with flat feet that involves drifting of the patella out of the trochlear groove. Sport Risk Concerns: “D-Quad” athletes notoriously have tight heel cords. Adolescent athletes with this foot type could potentially have more muscle cramping and endurance related issues due the inefficiency of gait. This athlete is at risk of a multitude of injuries due to associated muscle weakness of the lower extremities and core, particularly in endurance sports such as running. Management of the D Quad: Educate the athlete in gastrocsoleus stretching to assure proper performance and results. Avoid stretches where the heel drops off the edge of a step due to midfoot instability. Use night splints in severe cases. Core and hip strengthening are essential for this foot type to restore proximal stability. Orthotic recommendations include a deep heel cup, medial rearfoot posting and medial skive, and in some cases a metatarsal pad with soft topcovers to offload the 2nd met. Foot Morphology: The E-Quad Foot is one of the most unique looking feet, with a reverse-lasted foot shape created by an uncompensated rearfoot varus, combined with a structural forefoot varus. The arch is moderately pronated and there is a positive “creasing” toe-sign characterized by a sharp lateral foot angulation at the 5th metabase. Gait: This foot-type is a rigid foot that is unable to provide the pronatory motion necessary to load the medial aspect of the foot during stance phase of gait. It is for this reason that, when an individual with this foot-type is standing still, they will tend to stand on the outer borders of their feet with the inner side of the foot elevated from the ground. Compensation occurs in propulsion with a rapid abductory twist (medial heel whip) that allows the medial forefoot to eventually load. At times this causes the person to kick themselves! Common Injuries: Recurrent torque and strain on the foot and the muscles of the lower leg causes maladies like periostitis (shin splints), plantar fasciitis, tailor’s bunionettes, and knee pain. The adolescent athlete may be at risk of Sever’s Disease, Osgood Schlatter’s disease, Jumper’s Knee, and calcaneal apophysitis. Sport Risk Concerns: Risk of injury to the E-Quad athlete can occur in all sports but especially those that involve distance running, or rapid directional changes such as soccer. Management of the E Quad: These athletes have imbalances between agonist and antagonist muscle groups and should be screened for flexibility and strength. Orthotic recommendations include a moderate heel cup depth with medial rearfoot posting, and extrinsic medial forefoot posting with a 5th MTH cutout. Foot Morphology: The “F-Quad” is commonly referred to a Pes Planovalgus foot. The condition occurs when a severely compensated (pronated) rearfoot couples with an acquired forefoot supinatus, resulting in an extreme flat foot with a valgus heel and an abducted forefoot. This is an acquired foot type usually caused by a D-Quad foot that was not managed properly at a young age. This foot is typically called “Adult Acquired Flat Foot”, although it often occurs as early as 12-13yo. Gait: All the gait characteristics of the D-Quad are exaggerated in the F-Quad foot and pronation continues throughout propulsion, with excessive abduction of the forefoot (positive splaying toe sign). Common Injuries: The F-Quad is subject to all the same symptoms as the D-quad but to even a greater degree of pathology. Posterior tibial tendinitis can lead progress to dysfunction and potential rupture or tarsal tunnel syndrome. The abducted forefoot coupled with 1st ray insufficiency leads to HAV deformity with bunions. Sport Risk Concerns: “F-Quad” athletes will often be plagued by repetitive overuse injuries not limited to the foot and ankle. Shin pain, hip and knee pain, and low back pain are all common. Adolescent bunions occur most commonly in girls between the ages of 10-15. Hallux Valgus affects 22-36% adolescents and is very common in young dancers. Management of the F Quad: Core and hip strengthening are also essential for this foot type to restore proximal stability. Orthotic recommendations include aggressive medial rearfoot posting and medial skive. Medial forefoot posting may be useful depending on the severity and acquired stiffness of the supinatus; if used, a 1st ray cutout is recommended and on occasion a Cluffy Wedge. Conclusion: The best way to treat sports injuries in the adolescent athletic is through prevention. Understanding foot types and their propensity for injury allows the pedorthist the opportunity to treat the athlete before the injury happens, while eliminating the chance for repetitive, chronic injuries that could potentially have long term implications into adulthood. In a subsequent article I will discuss how to conduct foot screenings as an effective way to educate your community about pedorthics and help market your practice. Basra, S. Practical pointers on treating Sever’s Disease in young athletes. Podiatry Today. Oct 2011; 24(10):72-73. Kelley B and Carchia C. (2013, July 11). “Hey, data data – swing!” The hidden demographics of youth sports. Retrieved from http://espn.go.com/espn/story/_/id/9469252/hidden-demographics-youth-sports-espn-magazine. Leonard ZC, Fortin PT. Adolescent accessory navicular. Foot Ankle Clin. June 2010; 15(2):337-47. Longhino V, et al. The management of sacral stress fractures: current concepts. Clin Cases Miner Bone Metab. Sep-Dec2011; 8(3):19-23. Lord J and Winell J. Overuse injuries in pediatric athletes. Current Opinion in Pediatrics. Feb 2004; 16(1):47-50. Micheli LJ, Curtis C. Stress Fractures in the Spine and Sacrum. Clinics in Sports Medicine. Jan 2006; 25(1). Priscilla TU and Bytomski JR. Diagnosis of Heel Pain. Am Fam Physician. Oct 2011; 84(8):909-916. Dr. Louis DeCaro, Roberta Nole, MA, PT, CPED of Nolaro24, LLC, Dr. Jon Moore, Dr. Jeff Lehrman, Holly Burkman, MBA of Amerx, and Dr. Patrick Deheer of IQMed are proud to offer a convenient 2-day course on both the science and practice management of biomechanics, orthotics, equinus, and wound care for all ages. Over the past 15 years of lecturing our speakers have been asked hundreds of times “Why don’t you put together a course where we can learn everything from the science to the practice management of treating all ages and all feet?” Off the heels of 4 successful masters classes in 2017 & 2018, we have decided to improve our biomechanics program and add Amerx and their expertise on wound care and compression for successful patient outcomes. Whether you use the Quadrasteps, Littlesteps, or the Equinus brace already; or you dispense custom foot orthotics and use night splints, or already do wound care, this is the perfect seminar for you. We will invigorate and educate you on every aspect of biomechanics, orthotics, wound care, and equinus treatments. This seminar offers 13+ hours of content. A limited block of discounted rooms is available at $199 per night. This Course is Open to DPM, PT, OT, MD, CD, CPED, CO and all medical professionals interested in our lecture topics. Bring your Medical Assistants at a discounted rate! For more information email Casey Hoffman.